Lamb Hass Avocado, Flower A Not recommended for South Florida at this time. Need one more year. A lot of good things are said about the Lamb Hass in Califormia, including more dollars per acre than regular Hass. That will catch my attention. At this point there is no question on its quality. The issue for me is if it would grow similar or close to similar fruit in my area worth of commercial development. We will try. I only have a five gallon tree and will plant it to see how it grows and fruits in our South Florida environment. 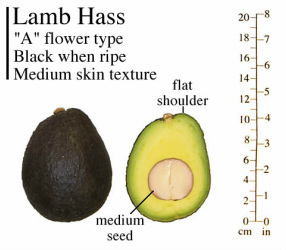 Read the information on the Proceedings of The World Avocado Congress III, 1995 114 - 118 about Lamb Hass. I do not sell trees, bud wood or fruit. I have this tree for experimental purposes and personal consumption if in fact they are consumable, jet to be determined. January 15, 2012: I top worked a tree. December 20, 2012: Out of the 3 grafts I inserted on the tree, one took and now is quite large. The tree is making flower buds now and I think it should flower in January. So it may flower with the So. Florida early varieties. January 19, 2013: The tree is indeed flowering in my grove now along with early varieties like Donnie, Dupuis and Beta. I top worked another tree in a different area of the grove back in December but the grafts are alive and not moving. This variety seems hard to graft on West Indies, other trees grafted in the same day are growing strong while these are not. February 28,2013: The tree Top worked in January 2012 is doing well and the tree is setting a good number of fruit to be a first year after being top worked. It has 10-15 dime size fruit. I hope it can keep it. i'm very encourage with this tree to be able to grow Hass like quality fruit in So. Florida. March 16, 2013: There are no more open Flowers, this tree has a shorter blooming period than my other trees. It has at least 20 small fruit o various sizes, This is very encouraging for a first year top worked tree. Usually they just want to grow vegetation for the first 12-16 months. I continue to be pleased with the performance, I just hope the fruit matures and survives our rain and heat in the months to come. Check this tread at the Cloudforest Cafe. What to expect here in South Florida will be a surprise. April 14, 2013: I'm really excited about this tree here in So. FL. The fruit is growing fast, there are definitely more than the 20 avocados I counted earlier, closer to 25. The tree is not dropping any fruit. In 3-4 years this tree could hold 200-300 fruit. It is beginning to get hot and the rain season is fast approaching. The fruit looks very clean, so far. April 17, 2013: I'm having trouble staying away from this tree and getting excited with what I see. The fruit is getting bigger. Counted at least 30, an increase from the original assessment since fruit is more visible now. They are growing very well, no fruit drop. See pictures. In less than a month the fruit has double in size. Have no idea about maturity but this could be the most exciting news on avocado in So. Florida. April 23, 2013. Check the Iphone video below. May 4, 2013: Succumbed to my desire to taste the fruit rather than evaluate the disease resistance of this cultivar in South Florida. After 3-4 inches of rain in 8 days, I sprayed the tree with copper. There will be time next year. Now I just want to taste it and see the maturity date. June 5, 2013: The fruits keep growing. There has been daily rain and high humidity for the last 15-20 days. Seems like its going to continue wet for few more days. One of the fruit is showing what appears scab, only one. As seen in the picture. Disappointing since I have sprayed the fruit at least 3 times with copper. In California the fruit last 12 months in the tree. Here I doubt it will last 8-9. No fruit has dropped its holding tight to all. June 12, 2013: I found 3-4 fruit dropped on the ground. We have had quite a few storms and lots of rain in the last few days. See Picture. Not sure what to make of it. Most trees have fruit drop. You can see the beauty of this fruit and its small seed. This is about half of that a fruit should be. June 21, 2013: No more fruit drop. Crossing my fingers. The fruit has been five month on the tree by now. The worst of the summer is yet to come. August 15, 2013: The fruit is holding well and growing. I have tagged two fruits and will start posting periodic thickness at the widest point Fruit #1 70.3 mm. Fruit # 2 73.8 mm. I just need to know when the stop growing. These have been 6.5 months in the tree. August 29. 2013. Fruits are holding on the tree they are measuring the same thing or very close. Concerns me no growth in two weeks. September 14, 2013: A little change. Fruit #1, is 71mm Wide by 85 mm long. Fruit #2, 76 mm wide by 93 mm long. Some growth in No. 2. October 3, 2013: Good movement. Some fruit, including #1 got sun burned because I cut the tree to its south exposing some of the fruit to full sun. Fruit # 1, 72 mm X 91 mm. Fruit # 2, 78 mm X 95 mm. We are past the dead of heat, moving into cooler nights and the fruit seems to appreciate the change. The average length of this fruit is 100 mm so they do not have long to go. I have not noticed any color change. With the large amount of rain we are getting and temperatures higher than California, I'm thinking that in early December we can begin to do some picking to test for maturity, providing the fruit begins to turn dark. I'm not sure how that is going to work here in So. Florida. November 1, 2013: The tree seems to have stabilized after the sun burn event. Not sure how much the fruit is growing but seems like it has some more time to go. November 12, 2013: I saw one of the larger fruits, in the 10+ oz range beginning to turn dark in about 20% of the surface facing the south (sun) it is shaded so it is not sun burned. This could signal the beginning of maturity season for this fruit. I will keep close tabs on it. November 14, 2013: I returned today to give these a closer look. Fruit no. 2 turning dark now is 80 mm X 97mm it grew a bit The new no. 1, 77 mm X 96, not showing any signs of darkening. Looking at these closely can be a December fruit in So. Florida. These fruit has been on the tree for 8 1/2 months now. Also the tree seems to be building flower buds at this time.Like the Sir Prize. These two could help pollinate each other. See pictures.This tree was top worked 22 month ago, it did struggled, since only one graft took. Now stands around 8-10 feet tall. November 26, 2013; The big day has come. I removed 3 fruit from the tree. One 10.8 oz. the fruit turning dark in the picture dated November 14, I will let that one ripen to see the taste. . Another one of 10 oz that I used to check the dry weight it came in at a decent 27.58% that would translate to about 17-18% oil. This is encouraging I hope as the fruit hangs longer in the tree this would get higher. By California standards the Hass can be picked at 20.8% dry weight. I also picked a 6 oz fruit than went totally dark. This concerns me a bit. Observations made: The fruit is a bit more rounder and smaller that I was expecting. Could be a zinc problem, some how this year my zinc dropped very low. I really was expecting fruit in the 12 oz, there are a few in the 10 oz range but most others in the 7-9 oz range. The seed seemed a bit bigger than pictures I have seen. I was expecting a smaller seed. On the other hand this is the first year post grafting so it was extraordinary the tree produced so much fruit. I will post pictures with today's date. The real test will come in a few days when I can taste the fruit. December 8, 2013: As the fruit picked 12 days ago ripened I detected soft spots on the skin. I opened today and here it is. I have seen this before on Florida Hass and to some extend in a couple of Nishikawas. Looks like stem rot but not emerging from the stem. Not sure what it is. Flavor wise in the edible parts was very good to excellent. There was no evidence of it in the green fruit picked for dry wait test. Disappointing, I do have other fruits in the tree. December 16, 2013: Some of the fruits are beginning to get dark so I picked a few, all in the 7-8 oz range. Disappointing as I was expecting the Lamb Hass to be larger. Let's hope they are edible. December 27, 2013: The fruit picked on the 16 of December continues to ripen unevenly and with soft rooted spots. There is fruit dropping from the tree once it turns dark. Contrary to what it does in the west coast that you can park the fruit on the tree for a while. Yesterday we had a heavy rail fall over one inch and some of the fruit could not handle it and cracked see picture in album. This tree is missing its home in California. I will give it one more year but do not go running planting a Lamb Hass in South FLorida!! January 5, 2014: The tree is dropping the fruit as soon as it gets dark definitely not holding the fruit.The fruit continues to ripen un evenly and with soft spots. January 9, 2014: A miracle happened, I has able to eat my fist Lamb Hass. One 10 oz fruit ripened well, some very minor issues as today's pictures shows. I have been washing the recently picked fruit with anti-bacterial soap really well after picking. It was just a hunch that there is a bacteria or virus causing some of the issues. May be more time in the tree?. Who knows!!!!! It was just like a store bought Hass or even better than some of the imported fruit we get in the supermarkets. However as you can see in the picture there are some dark fiber looking spots, and some kind of rot under the skin, that rotted tissue went with the skin so it did not affected the appearance or taste. The fruit is fiber less and very creamy. January 14, 2014: I cut open another 10 oz fruit from the Lamb Hass tree. More disappointment. More of the sub skin rot. Also I found like a fibrous dome, about and 1 1/2 inches at the wide side, facing the inside of the skin. about 5/16 thick. Very discussing. See today's date photos. The part that was eatable was average. I would not trade it for a good Monroe or Catalina. February 5, 2014: The tree is pushing a vegetative flush and also flowers at the same time. Some flowers are open. Also some fruit still hanging on the tree. Also a bit sun burned. February 27, 2014: All fruit has dropped the tree is in full bloom and pushing new growth, saw some small fruit set. March 5, 2014: The tree is setting fruit nicely. See today's date pictures. This tree does well in So. Florida except for the issues we experience with fruit maturity. March 19, 2014: The tree continues to do well and setting a lot of fruit. March 24, 2014: The tree is setting a lot of fruit and is growing very quickly/ See short video bellow. April 28, 2014: Seems to me the fruit this year is more elongated, las year it was rounder. I suspect this tree is very susseptible to zinc deficiency and last season my zinc levels got very low. Late last year an Israeli agronomer is his 70+ came by my grove, as soon as he saw this tree he said "you have a Zinc deficiency" because of the shape of the fruit. Apparently this Hass and its relatives feel it. Pictures soon. October 24, 2014: Picked some more fruit in the 8-10 oz range. I expect that these will take at least 10 days to ripen if they do. They look darker in the picture than what they are. December 12,2014. The fruit picked on October 24, 2014 dot not ripened well. Picked a nice size Lamb Hass today, 12.7 oz to see how it does. It is a very clean looking fruit. December 23, 2014: The Lamb Hass tree continues to perform well. Looks good and the fruit looks even better this year. It sizes clean fruit to 12 oz consistently. The maturity and ripening issues is another item. From this day on I think we get into maturity time. The fruit has not turned dark but is loosing its shine. I picked 2 to see how they ripen. February 26, 2015: This is an amazing tree too bad I have no idea how or if its even possible to control the rot that appears on the fruit once it ripens. I have not been able to eat a single one. The tree is holding a lot of fruit. Most turning black, a sign that they are ready and it is flowering and setting a lot of fruit at the same time. December 12, 2015: The tree's fruit is beginning to turn dark. I have two trees full of fruit. Sure some on the ground but it still has a lot of fruit on it I I did take two to give it another try this time I did apply post harvest fungicide to see how it affects the ripening process. The larger fruit is about 9 oz. may be a few in the 10 oz range. Smaller than last year. They have stopped growing. The tree is getting ready for next season building flower buds. Tree no 1 even has flowers open. December 23, 2015: The fruits that were treated with post harvest fungicide are turning out to be like the others, Real bad. I will discontinue to work on these trees and will probably cut them down by summer. See today's picture. Really disgusting.